Where traditional retail meets Pop-up culture, meets technology… In times of financial struggles on the high street where row after row of empty shop units became the norm in towns and cities across the land and when many retail giants bit the dust, Pop-up culture gave us ‘taster shopping’. Helping to rethink the retail landscape and how consumers were engaged and converted, Pop-up shops invited us to experience a product or company within set parameters (product range, space, time, etc). Fast forward 5 years or so on and this practise cannot have escaped the attentions of traditional retailing as it streamlines its ‘bricks and mortar’ set-up having seen that increasing expensive floor space does not necessarily equal increased turnover. Taking it a step on, where the ‘bricks facilitate clicks’ through the investment of in-store technology to provide continuity of the customer ‘taster’ experience, ‘in a click’, is looking like a way to go. Last year whilst living in Amsterdam, I visited the newly opened Marks and Spencer store after the company returned to the Netherlands following several years’ absence. Being a Brit abroad, I was personally very excited to have a little bit of ‘home’ on my ‘home from home’ doorstep but was initially horrified (ok, I exaggerate; dismayed) to discover that it was a ‘Simply Food’ outlet with a ‘side’ of fashion. However, this feeling soon changed to one of surprise and ‘reconnection’ with a company I was very familiar with (familiarity breeds contempt?) when I realised that this was the retailer’s new ‘E-boutique’. Featuring ‘Virtual Rail’ technology which seamlessly integrates digital rails with physical rails of clothing samples, the customer gets to experience the company’s full product range online via in-store iPads, select an outfit to ‘try on’ in front of the *virtual mirror, then make the purchase with free delivery or collection from the store. 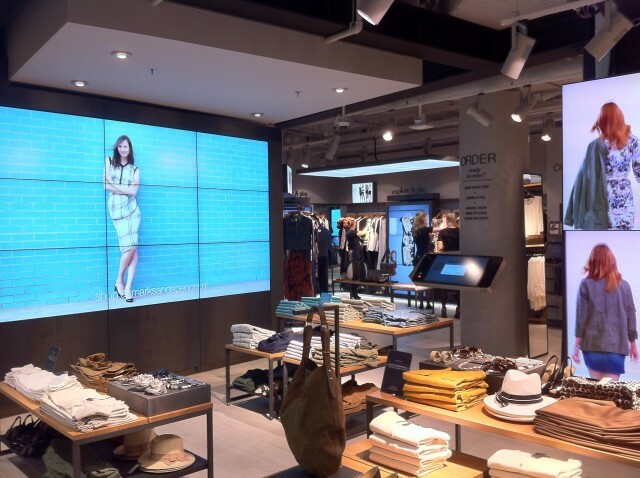 It is a part of Marks and Spencer’s bid to combine online and in-store shopping to become a leading international, multi-channel retailer; this being its response to the changing way that it’s customers shop. Having personally ‘cut my teeth’ in retail with my sleeves rolled up out on the shop floor and armed with the writings of Paco Underhill on ‘Why We Buy’, it is also important to acknowledge that shopping is still an innate emotional experience for many customers, especially women. Being able to physically touch and feel products, resulting in immediate gratification can be critical in deciding a sale. With ‘Showrooming’ being a thing , it is important for retailers to recognise that customers are switched on, teched-up and not afraid to use it to set the parameters of the transaction, in a bid to acquire what they want, in a way that they want it. However, providing a space where they can experience the best of both worlds, the physical and virtual, seems savvy right now. Tags: amsterdam, brand journalism, bricks to clicks, E-Boutique, Marks and Spencer, Paco Underhill, pop-up shops, pop-ups, retail, shopping, Showrooming, Simply Food, Virtual Rail, Why We Buy. Bookmark the permalink.